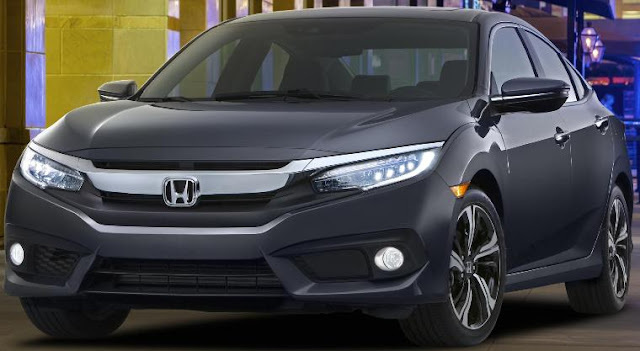 The all-new 10th-generation 2016 Civic Sedan, on a 1.2-inch longer wheelbase, nearly 2 inches wider and 1 inch lower, gets a 2.0-liter, 16-valve, DOHC i-VTEC™ 4-cylinder engine mated to either a 6-speed manual (LX trim) or continuously variable automatic transmission for the LX and EX trims. A new 1.5-liter, direct-injected and turbocharged 16-valve DOHC inline-4 engine mated to a unique CVT will be in EX-T, EX-L trims and Touring trims. Both engines are targeted to receive EPA highway fuel economy ratings in excess of 40 mpg. Torsional rigidity of the new body is improved by 25 percent, aided in part by more intensive use of ultra-high-strength steel. New standard equipment includes automatic climate control with dual-zone on EX-L and higher trims, auto-up/down front power windows, an electronic parking brake with Brake Hold, Walk-Away auto door locks and an adjustable driver's seat thigh support with 14 degrees of tilt (EX-L and above). All Civic Sedan models also feature a larger, reconfigurable new center console with up to 7.2 liters of secure storage space, approaching SUV levels of console utility.